Reservation Point is at the very southwest tip of Terminal Island, which includes the US Quarantine Station and a federal prison. Photograph from “Terminal Island.” Wikipedia, The Free Encyclopedia. 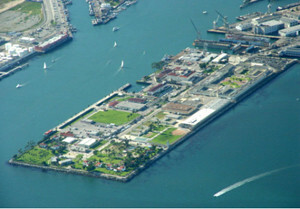 Terminal Island currently houses one of eight Department of Homeland Security’s Immigration and Customs Enforcement Detention and Removal Operations Service Processing Centers. Here “undesirable unauthorized aliens” are held until they can be deported to their country of origin. During World War II, the Island’s resident Japanese American population was ordered to relocate with one week of notice. The facility was then used to process Latin American civilian prisoners, deported from their homes in Central and South America to be interned in enemy alien internment camps in the U.S. (See also: the Gurcke Family Story) It was at centers like these that Latin Americans internees were charged with illegal entry into the country, which allowed the U.S. to detain them indefinitely or repatriate them.